Client data sharing Insurance Billing - New! 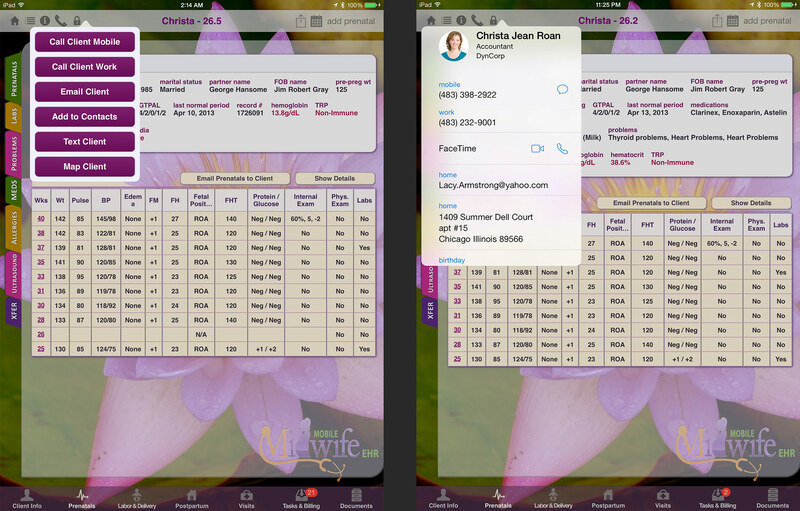 iPhone Contacts Integration Lactation Client Feature - New! Visit our HOW TO page to learn how to create document templates, send client invoices, handle repeat clients, superbills and much more! 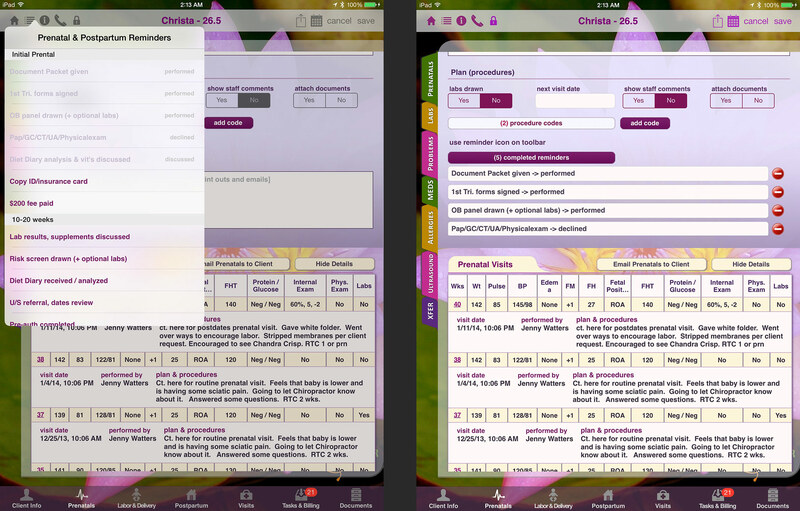 Mobile Midwife EHR is now fully functional on all iPhones from iPhone 5 to the XS Max. It is custom designed to take advantage of the entire space available on each of these phones specifically. 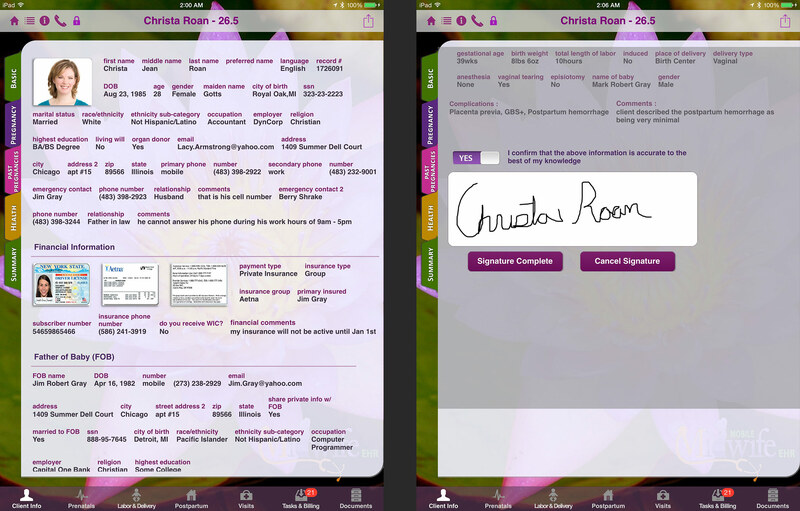 Now if a client presses on your client portal link from an iPhone they will be directed to fill out your forms and sign all your documents from the Mobile Midwife EHR app! 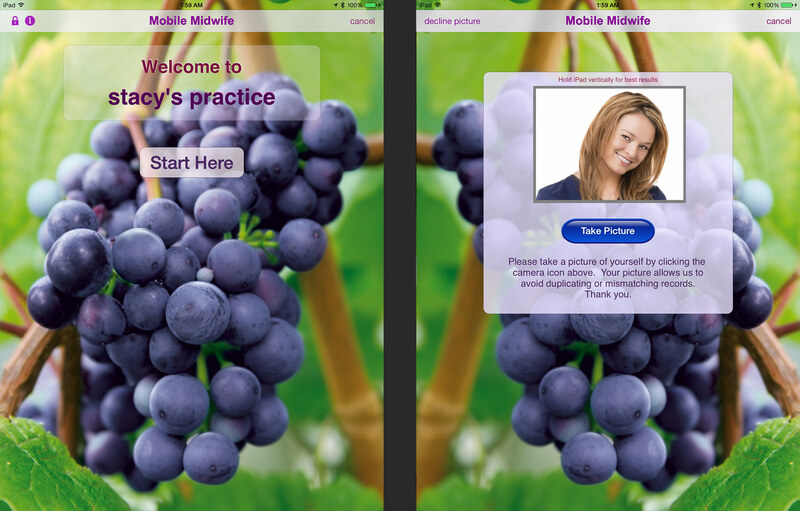 Below is the login and home screen of Mobile Midwife EHR. 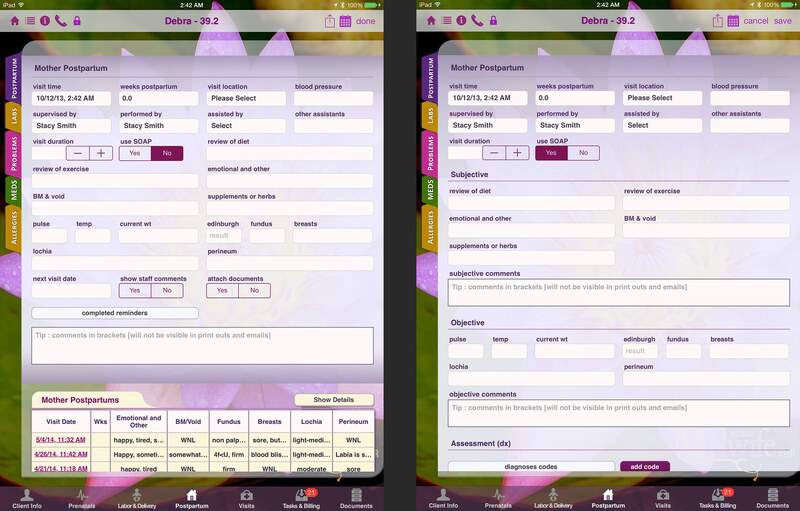 You can login to your practice from ANY iPad, anytime. The first time you login you must have a Wi-Fi connection. Thereafter no Wi-Fi connection is needed to use the app. From here you can see all of your clients. 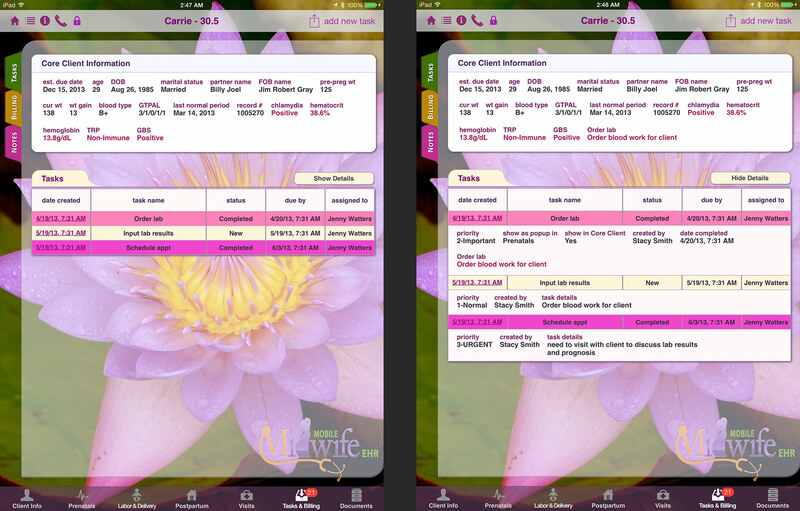 Pregnant and postpartum clients are under the Pregnant and Postpartum tabs. Lactation clients are under the Lactation tab and Primary Care, Chiropractic or Preconceptional clients are under the All Others tab. Clients are listed in alphabetical order, EDD or infant age. Type one or more letters in the search box to find any client by name or record #. Tap the "Add Client" button to see the welcome screen to the right. Tap the lock button to keep the patient from exiting their record and view other patient data. After the client takes their picture they will fill out their basic information as seen in this picture (Click the picture to enlarge it). Once they are done they tap the "Next Step" button. 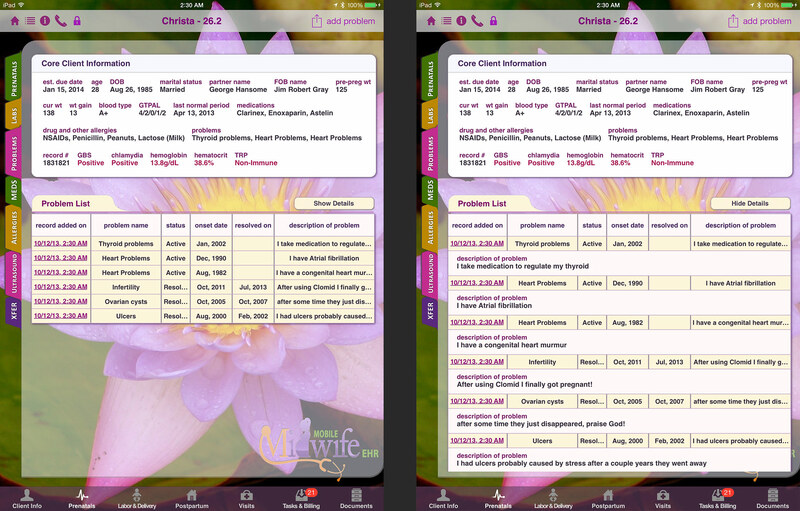 Once the client enters this information, their changes get automatically uploaded to the Mobile Midwife servers and if there are other iPad users in your practice they will automatically receive updates every few minutes. 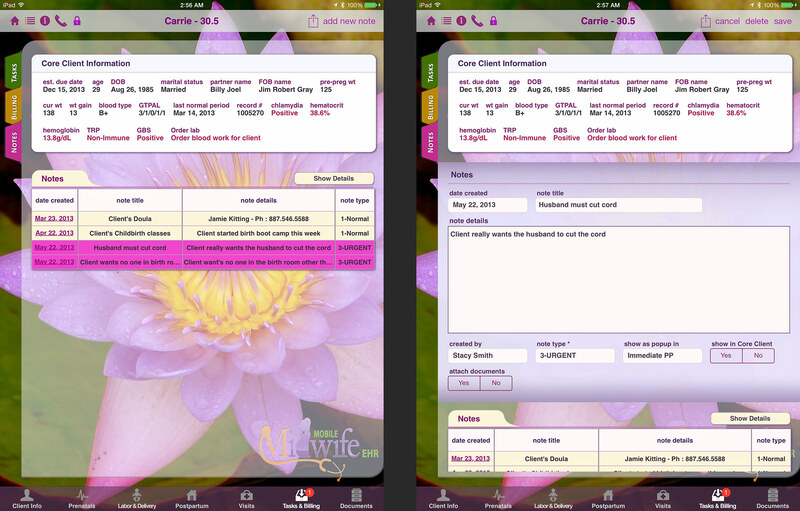 Now the client will fill out information about their current pregnancy and their gynecological history. Note, when adding a new client the toolbar will show "Step 1 of 5", "Step 2 of 5" and so on. 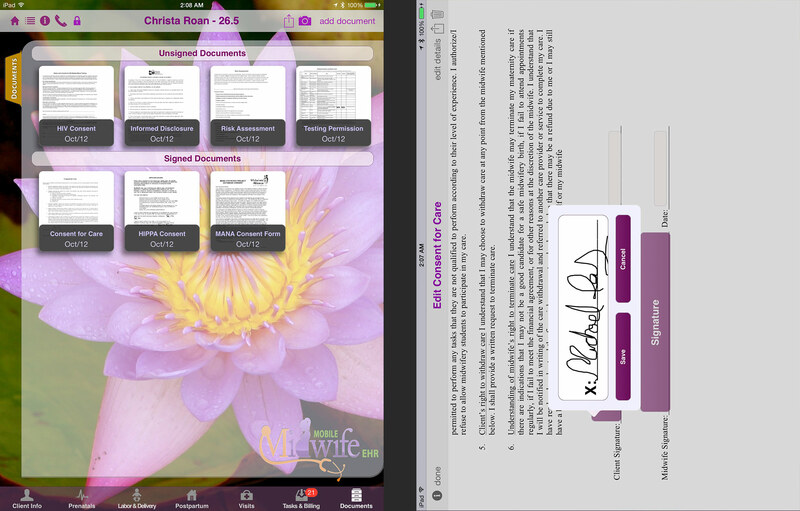 As the client fills out the forms they will press the "Next Step" button at the bottom of each screen until they finish signing all of your consent forms at the end of the process. This is where past pregnancies are entered. The client's GTPAL that is shown elsewhere is derived from this information. 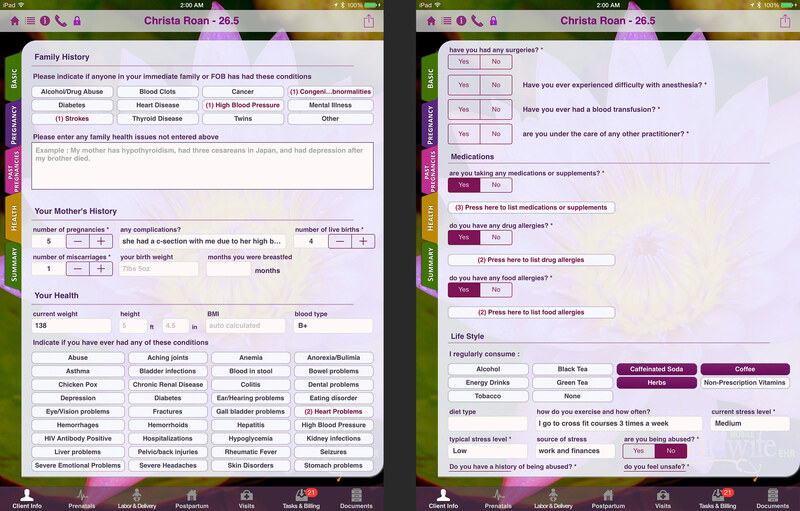 Here the client will fill out their family and personal health history, medications, allergies, surgeries, life style details and Gyn history. 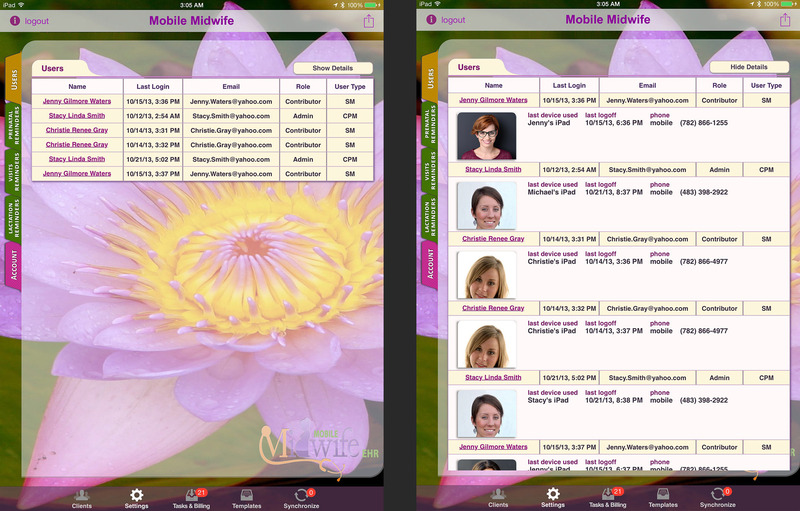 Keep in mind you can request the Mobile Midwife EHR support team to add or remove any fields you like. We can change almost anything on any form within minutes and have the change automatically pushed to your devices. This is the rest of the Health form. 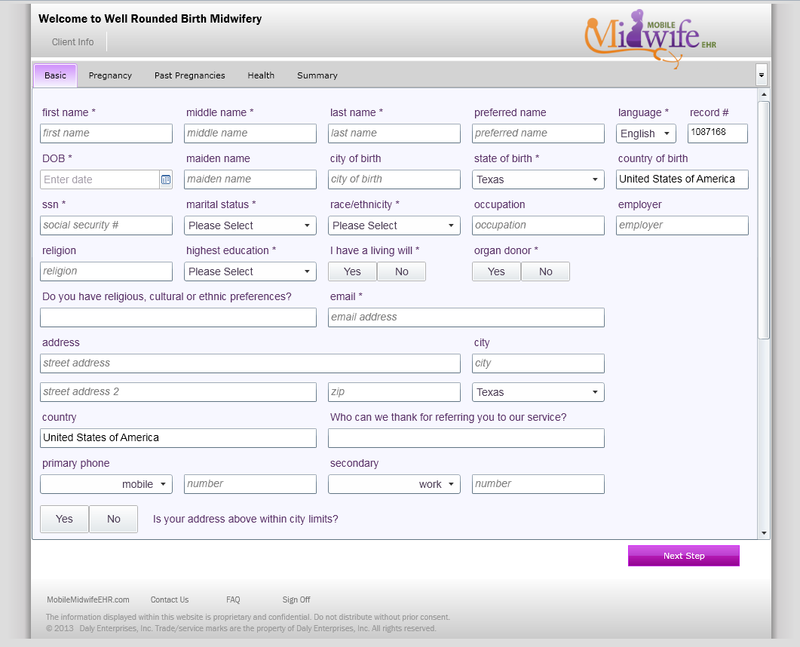 Note, the Mobile Midwife forms are very interactive and there are many fields you do not see that only appear when other selections are made. This is the last step of the sign up process. 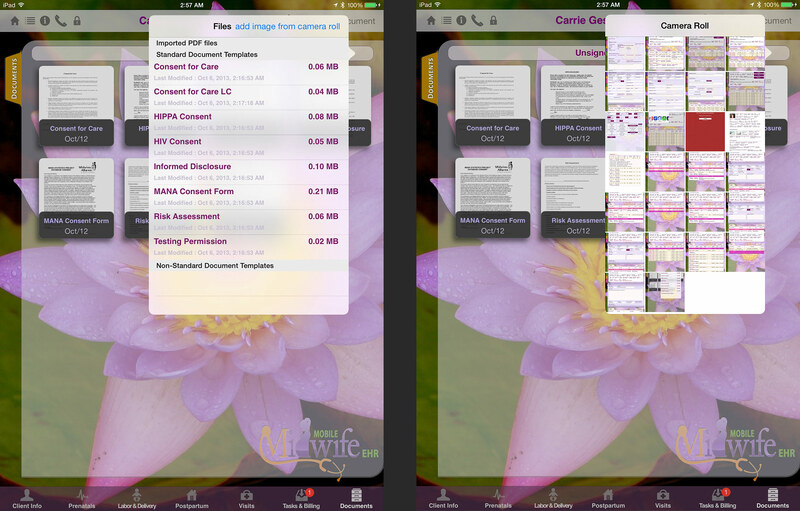 With this feature your practice can finally go totally paperless! 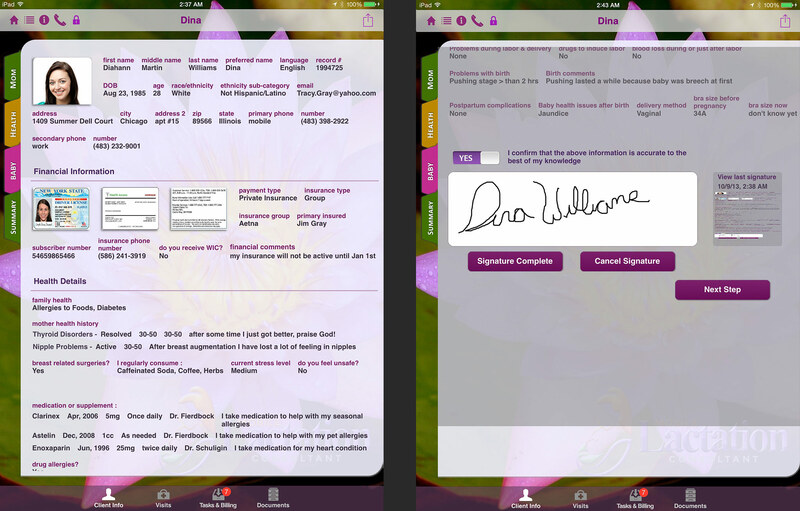 The patient will write their signature on your documents on the iPad itself using their finger or a stylus. 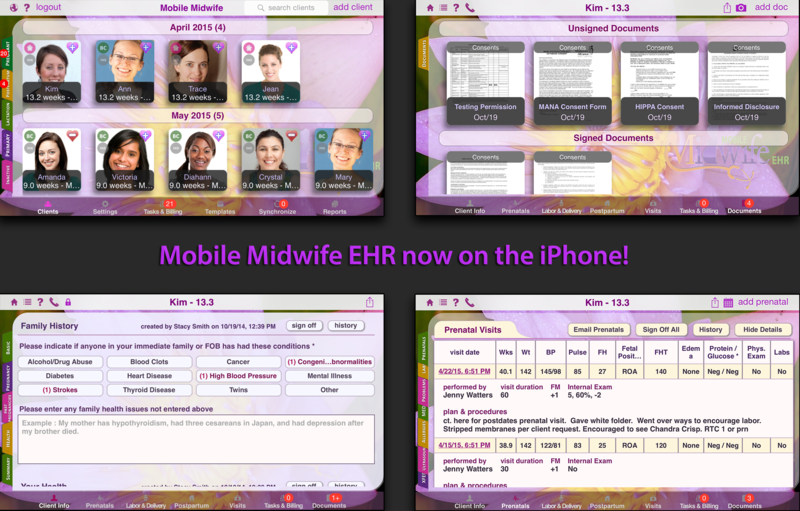 You can import any PDF you like into Mobile Midwife EHR as a template. You then drop check boxes, text boxes, signature and initial boxes in all applicable areas on the PDF document. Then anytime you create a new client, an instance of these documents will show up under their Documents tab as ready to sign. 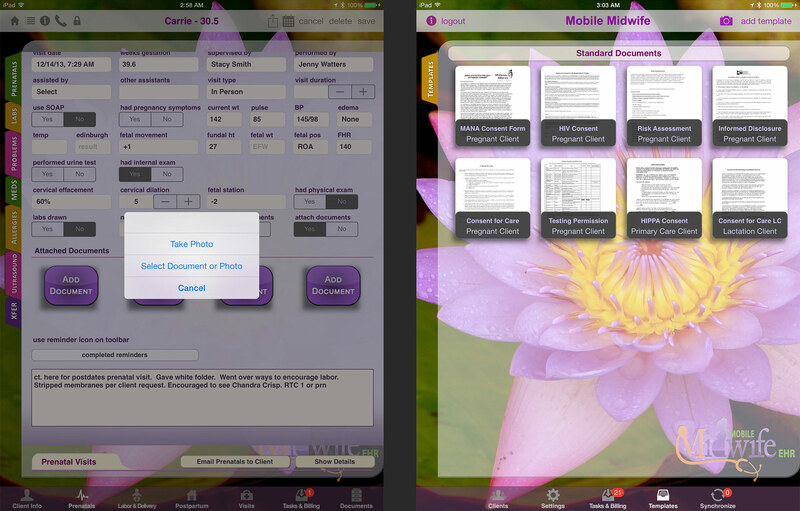 With Mobile Midwife you can go totally paperless because your clients are directed to sign all of your consent forms during the sign up process! 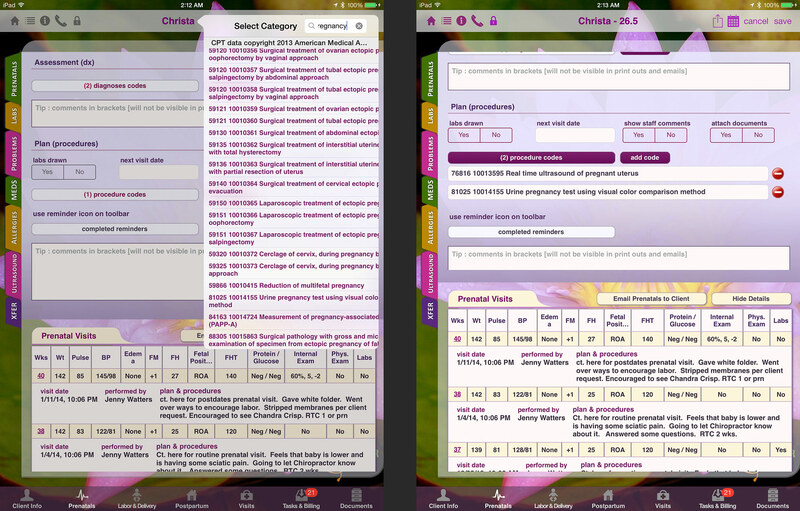 Mobile Midwife comes with eight generic consent forms. However you can import any document of your own choosing and make it interactive with check boxes, text boxes and signature boxes. There are many ways to import a document. 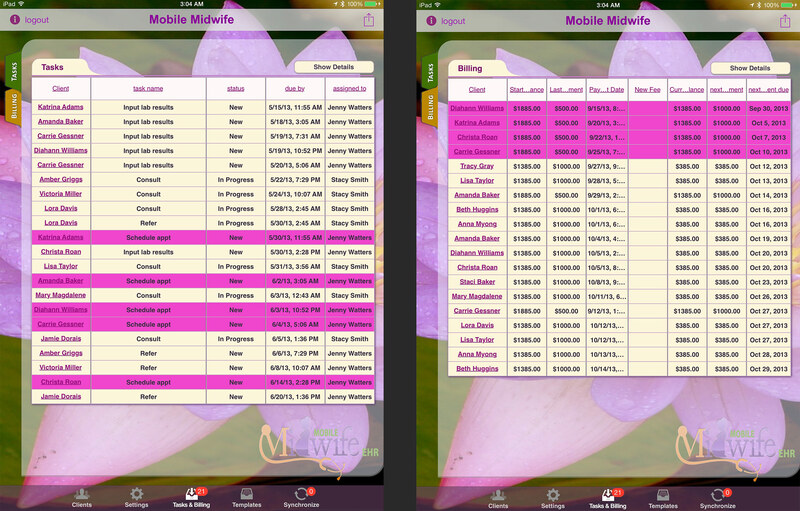 A PDF can be dropped on the Mobile Midwife app from iTunes or Dropbox can be used. Most users however email the PDF to themselves and then open that email on their iPad. Then press & hold on the attachment and chose to open it in Mobile Midwife. 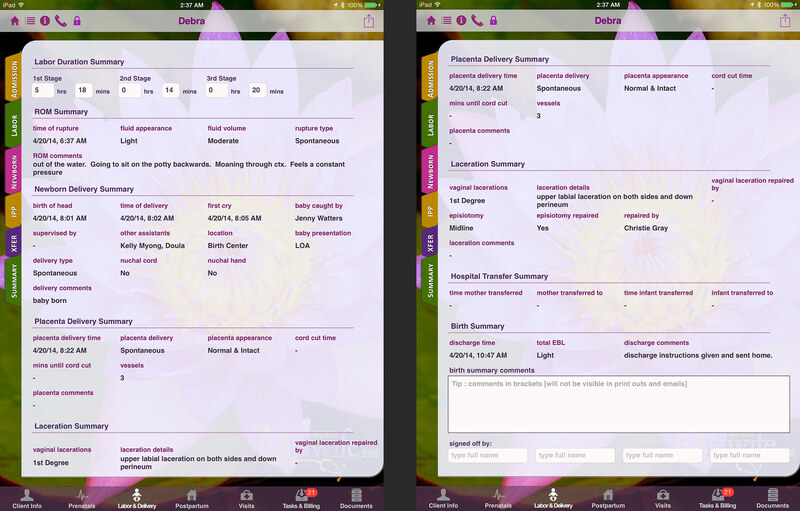 Then press "Add Document" on the toolbar from within the Documents or Templates tab and touch the name of the file that was just exported to Mobile Midwife. 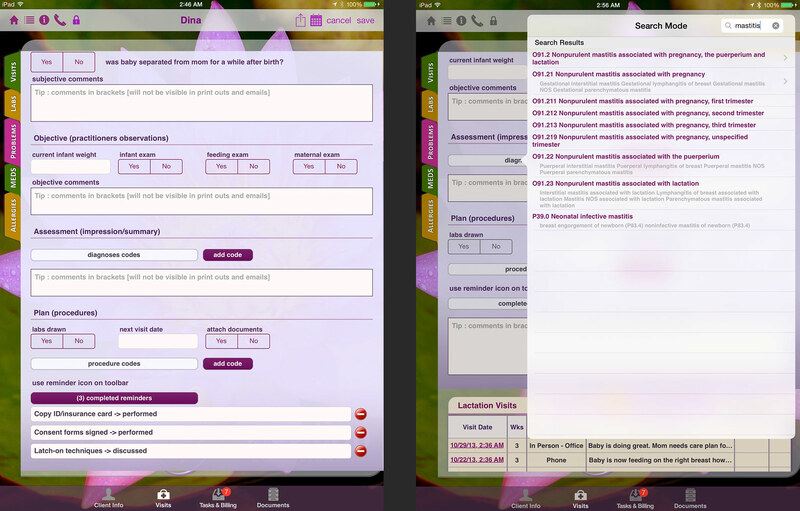 From the Prenatals tab you can record prenatal visits. This includes inputting their vitals, measurements, lab work, internal exam info, physical exam, comments and more. 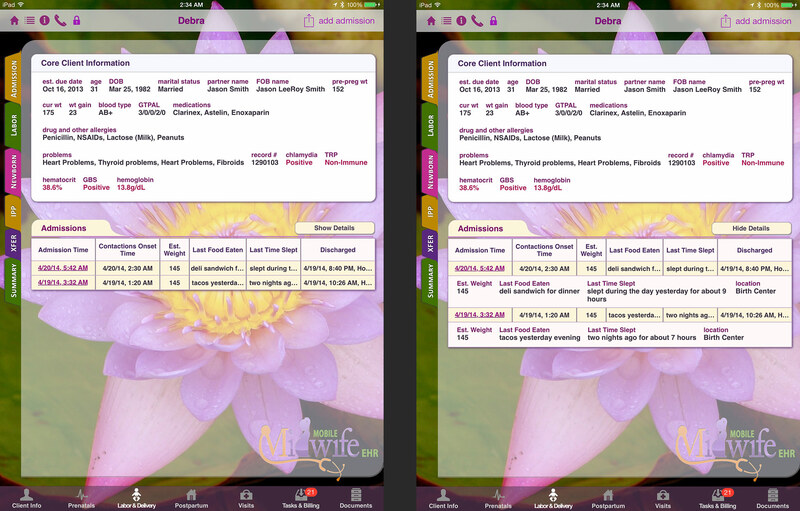 When adding a prenatal you can choose to chart with SOAP or without SOAP. 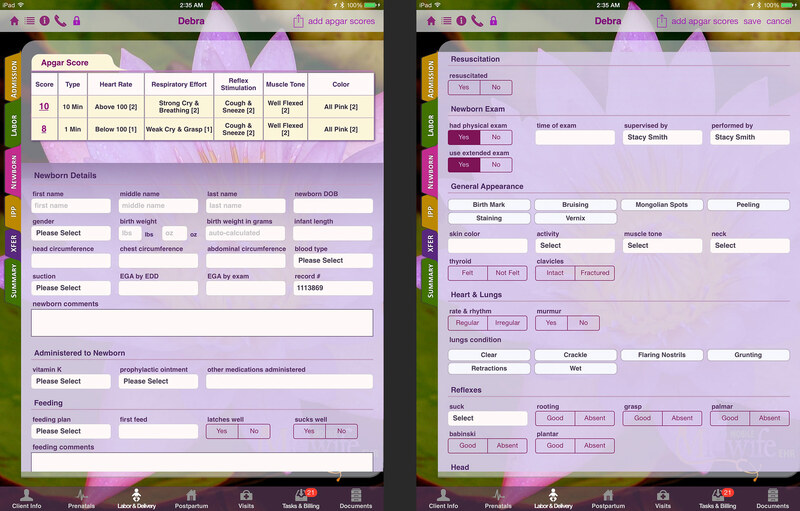 If "Yes" is pressed in the "had pregnancy symptoms" field then additional fields will appear so you can capture which symptoms the client experienced. Note, when viewing the Prenatal later in "show details" mode or printing, only fields that have been answered will appear. This makes your charting easier to read and more professional looking. In SOAP charting the "Subjective" section is where you gather feedback from the patient. 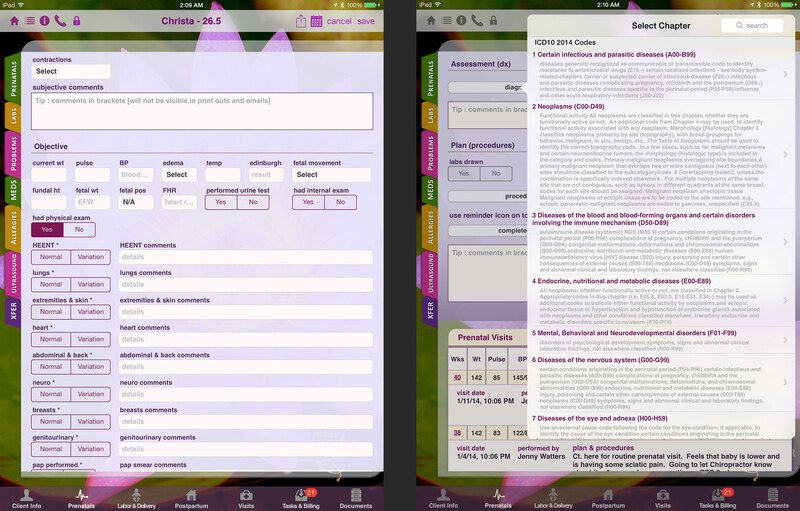 The "Objective" section is where you gather your own information by capturing vitals and performing exams and so on. The "Assessment" section is where you document your diagnoses and the "Plan" section is where you document your prognoses or plan of care. In this screen you can see part of the physical exam section that appears when "Yes" is pressed for the "had physical exam" field. 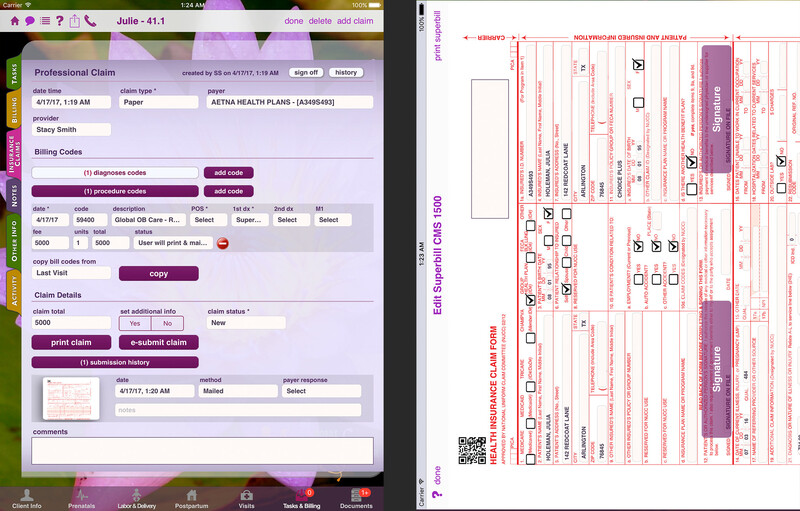 Many fields are not shown in the screenshots such as the internal exam and urine test sections. Notice the popup in the second screen shot that lists the ICD10 codes. This appears when the "diagnosis codes" button is selected. You can navigate to a specific ICD10 code by drilling down through the correct categories, or by typing any text in the search box such as "edema" or "mastitis". This screenshot shows what happens when a search is performed in the diagnoses code popup. 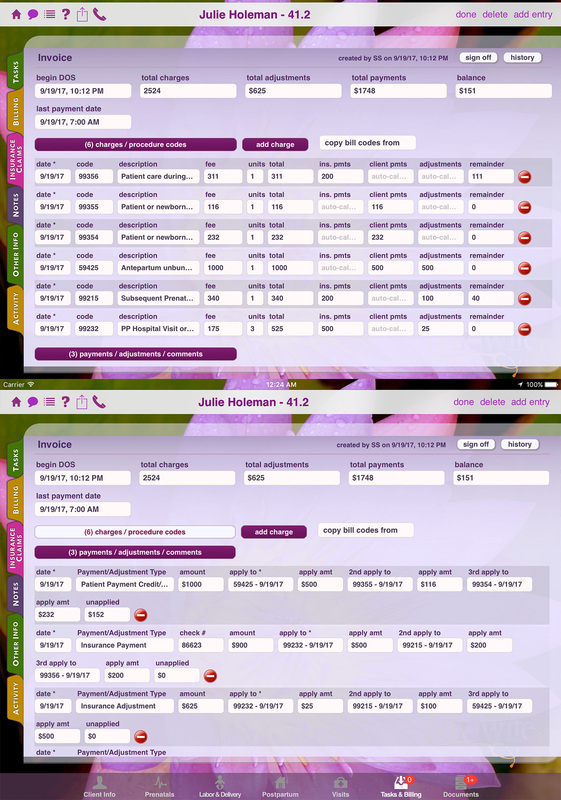 The second screenshot shows how the diagnoses codes are captured in the Prenatal Visit form after various diagnoses codes are chosen from the popup. This screenshot show the Procedure Code popup that displays ALL the CPT codes and works in the same way as the diagnoses codes popup. Pressing the reminder icon will cause the reminders to display. This features is different from the tasks feature because it is a static list that is the same for every client. This static list is configurable under the Settings->Reminders tab. If a prenatal or postpartum visit is being edited and a reminder item is checked off then that reminder item will be recorded under that visit. As a reminder item is tapped multiple times it will cycle through 4 different status. They are Performed, Discussed, Declined and N/A. To share data with your client, after each visit you can press the "Email Prenatals to Client" button. Once that button is pressed, the prenatal visit information is saved to a password protected PDF and attached to an email as shown in this screenshot. Note, any comments made in Mobile Midwife that you enclose in brackets ([ and ]) will not be shown anytime you print, email or export client information. 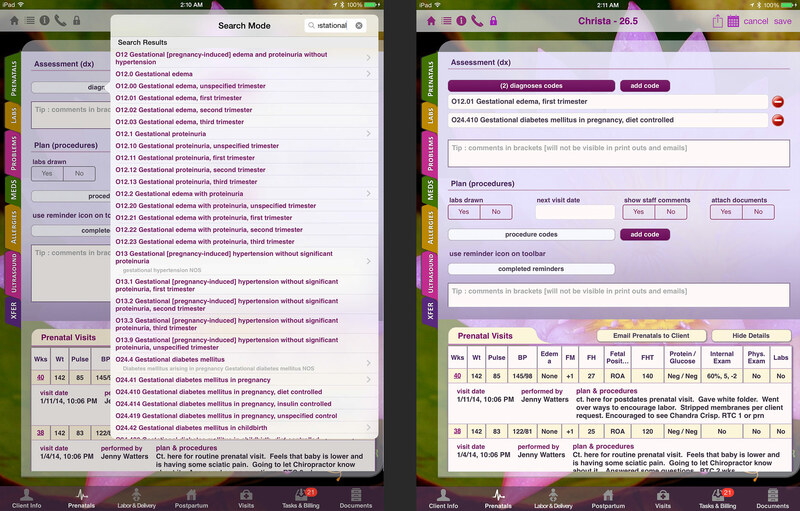 The second screenshot here shows how an appointment can be placed on your calendar using Mobile Midwife. 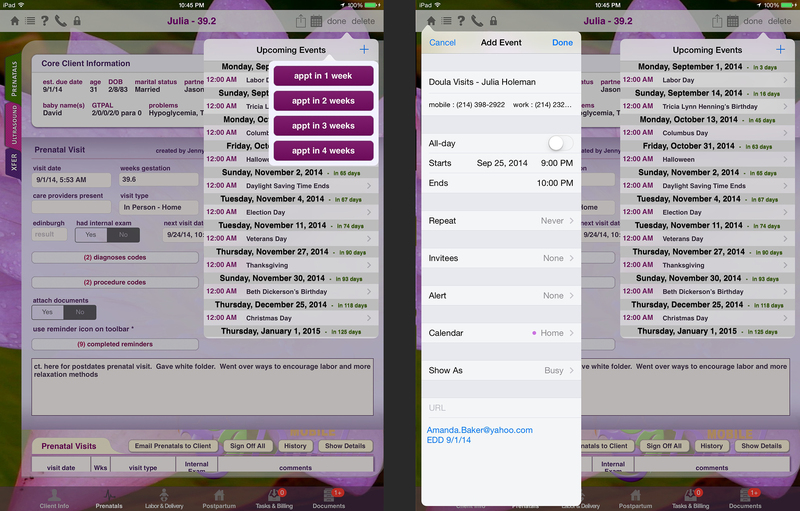 The appointment can be placed on any Calendar that is configured on the iPad, such as iCloud, Google, Yahoo and Hotmail. Important information is placed in the calendar even such as the client's contact info, EDD and more. Press the phone icon to add a client to your iCloud, Google, Yahoo or Hotmail contact list. 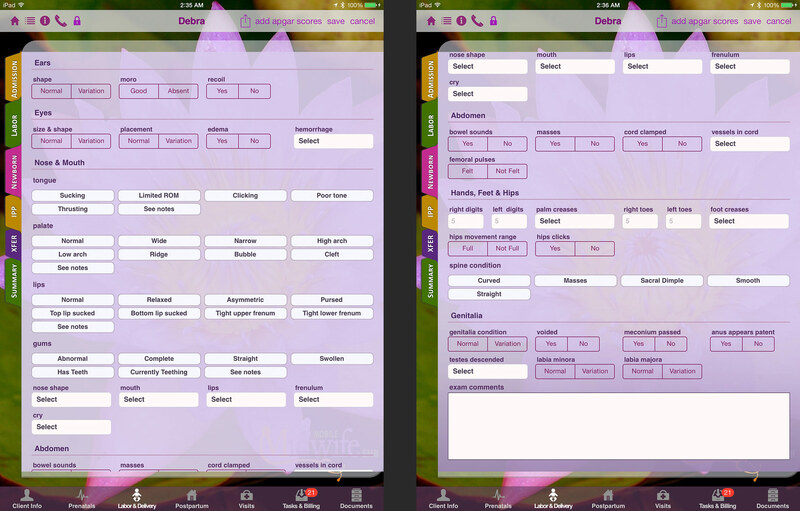 Mobile Midwife populates the contact record with the client's photo, phone numbers, EDD, email, address, partner name and more! Recording lab results is easy and flexible especially now that we integrate with Quest Diagnostics, LabCorp, Interpath, RML and more! Abnormal results will automatically show up under the Client Core Information that appears at the top of most screens. 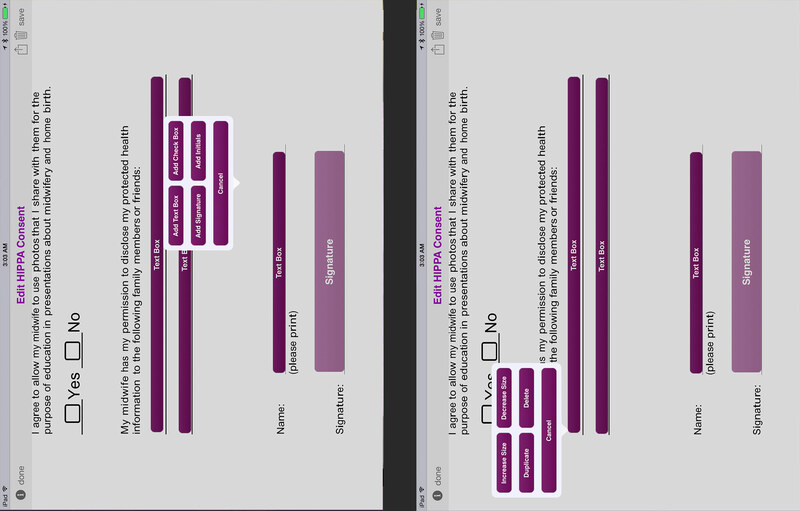 The screenshot on the right shows all of the various results that can be entered. 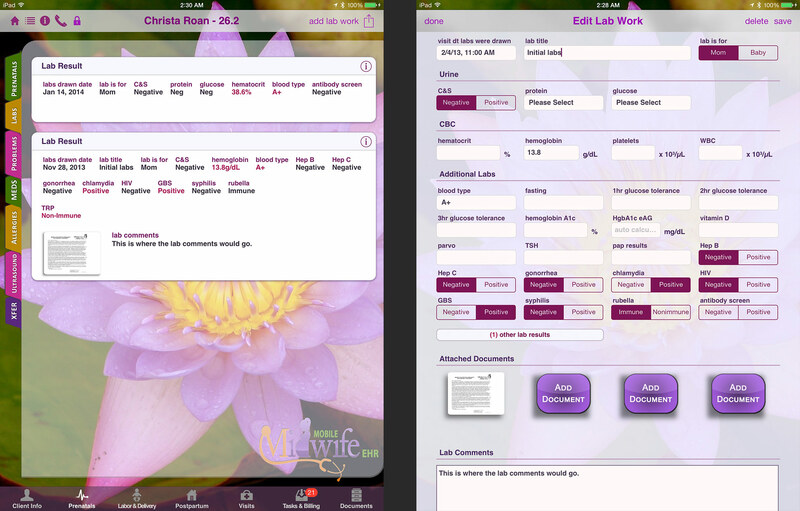 The "other lab results" section can be used to record any lab result. The attached documents section can be used to attach the actual lab results documents. Any PDF can be imported into Mobile Midwife and attached to a client record. If you would like your Mobile Midwife account to integrate with your lab company then give us a call or send us an email. Lab integration can save you many hours a week and can improve the integrity of your charting by reducing human error. Never get caught again during a hospital transfer without knowing where your labs are. With Mobile Midwife lab integration, your lab results will automatically and seemlessly flow into your account under the appropriate client record. An email will be sent to you when new lab results are received so you can know to login and and view that client's record. 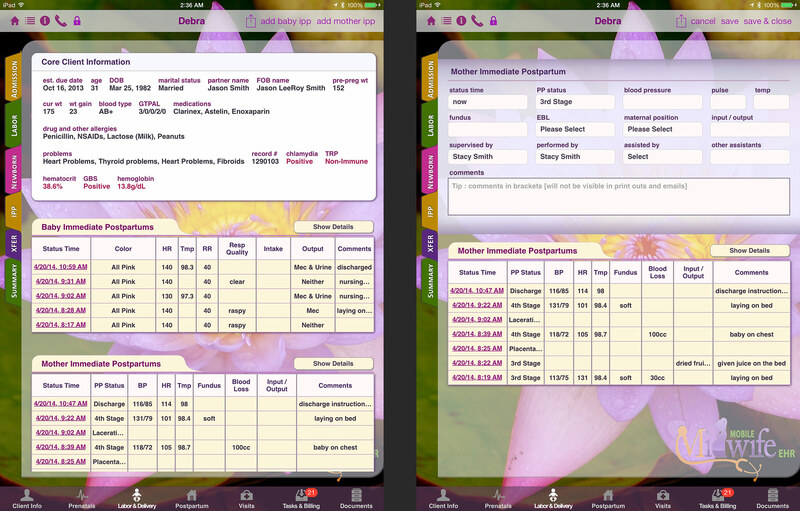 The Admissions tab is the first tab under the Labor & Delivery section of Mobile Midwife. 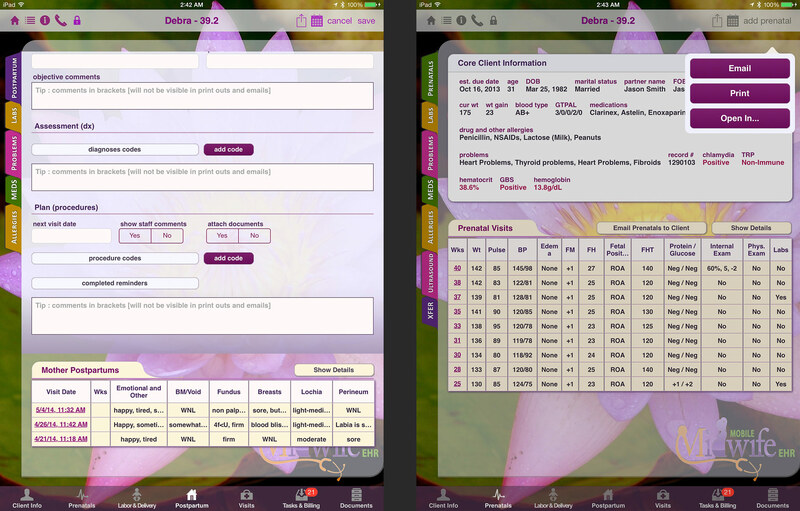 This tab is used to chart admissions and discharging of clients. 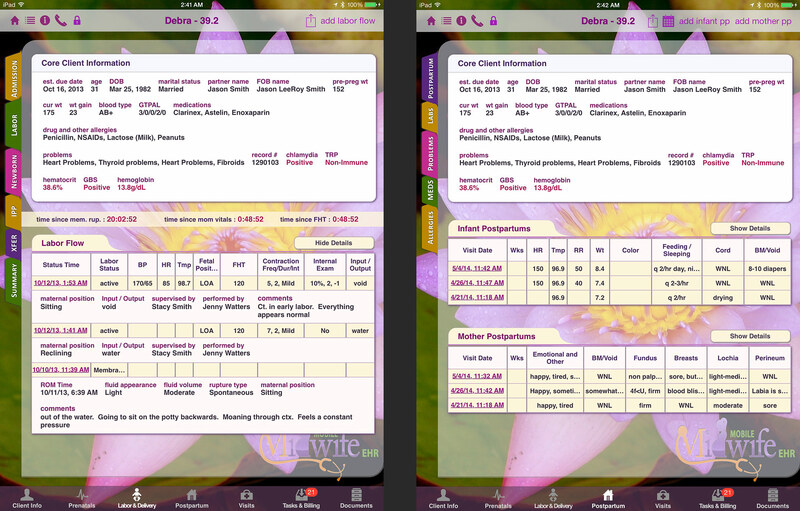 It is also used to measure the length of labor which is displayed in the birth summary tab. Once baby is born the newborn tab is used to enter APGARS and details such as their name, gender, measurements, medications administered and their feeding status. Also on this screen is where the newborn exam is documented. There is a brief NBE and an extended NBE. In this screenshot the first part of the extended NBE is shown. The next screenshot below shows the rest of the exam. This screenshot shows the rest of the newborn exam. This NBE is also available under the infant postpartum visits form. 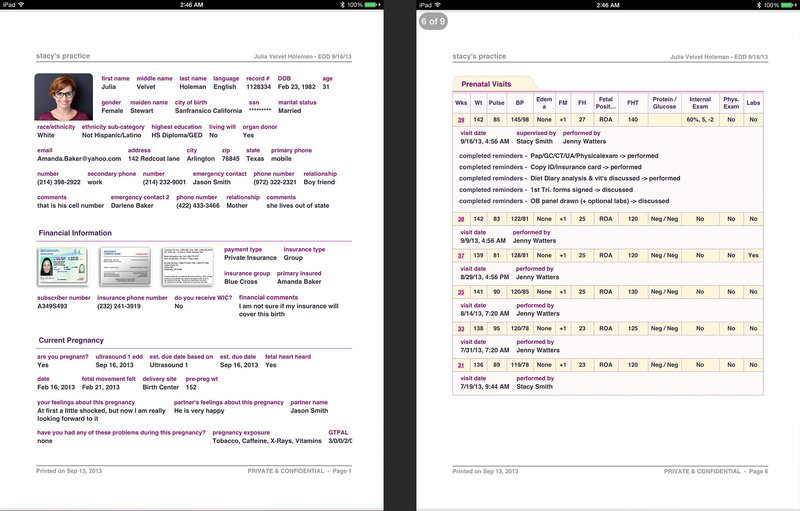 Once baby is born and APGARS charted in the Newborn tab the IPP tab will be used to chart the remaining birth events. When adding a Mother Immediate Postpartum record one of the following status will be selected which will drive what the rest of the form looks like: 3rd Stage, Placenta Delivered, 4th Stage, Laceration Details and Discharge. 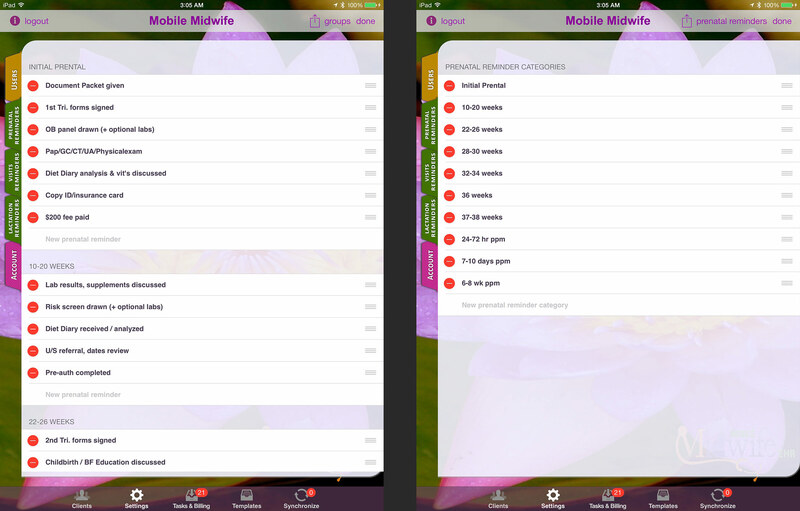 As we move on to the postpartum section we first want to step back and show the labor flow timers that appear in the Labor tab during labor. These timers keep track of the last time mom's and baby's vitals were taken and how long mom's membranes have been ruptured. 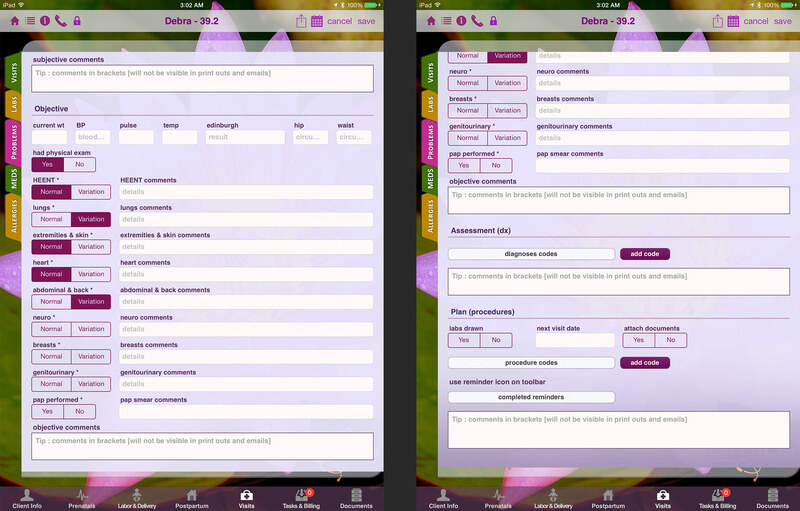 The postpartum visit form operates in much the same way as the prenatal visit form does. You can choose to chart using the SOAP methodology or keep things short and sweet. 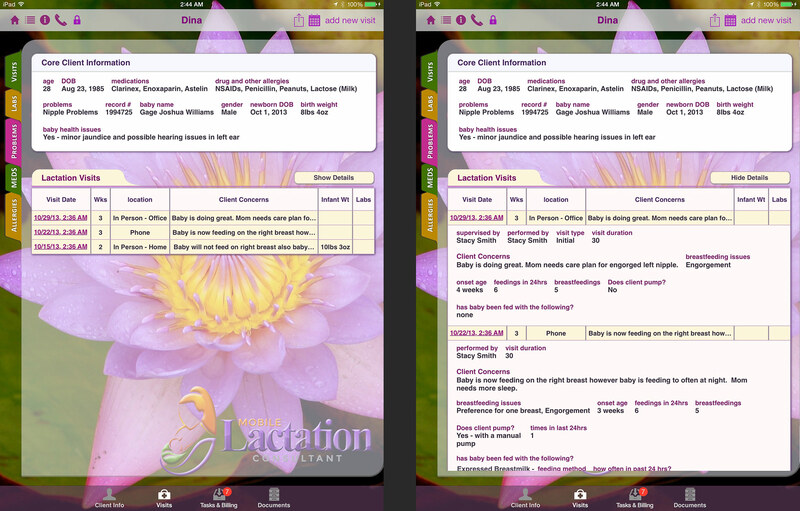 The visit location field allows you to choose from Home, Birth Center, Office, Hospital, Phone, Email, Text or Other. 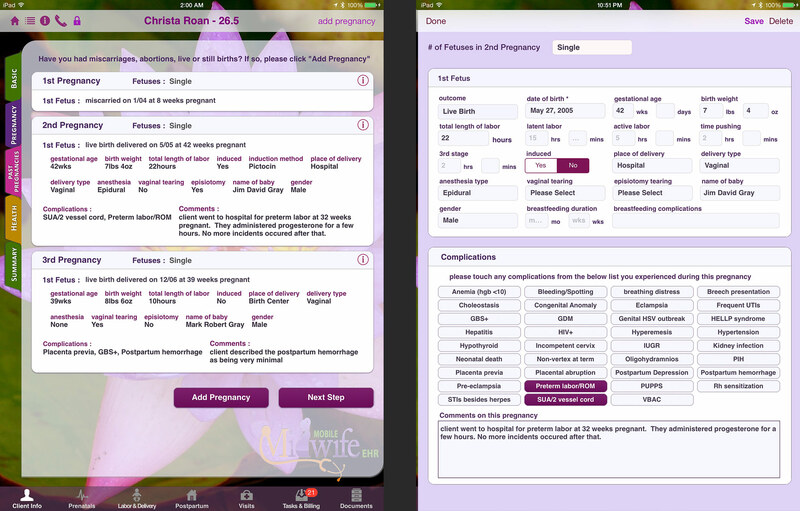 For more information on how the diagnoses and procedure codes and completed reminders work please read about the Prenatals feature above. Located at the top of every screen on the toolbar is a button that has a box with an arrow coming out of it. This button allows you to export data from the client record to an email, printer or password protected PDF by pressing the Email, Print and Open In buttons respectively as shown in the screenshot. After the Email, Print or Open In button is selected from the above screenshot this other screenshot titled "Export Data" will appear. This is a powerful little form that allows any part of the client record to be exported. Any combination of categories can be exported. You can choose to export no documents here but then later go to the Documents tab and open whichever documents you want to print and print them from there. Note, it is not against HIPPA policy to email client records, however they encourage practitioners to password protect private health information whenever reasonably possible. So, if you are emailing or exporting this client data as a PDF then enter a password in the "password protect PDF" field and then contact the intended recipient in a separate email or text and provide them the password. 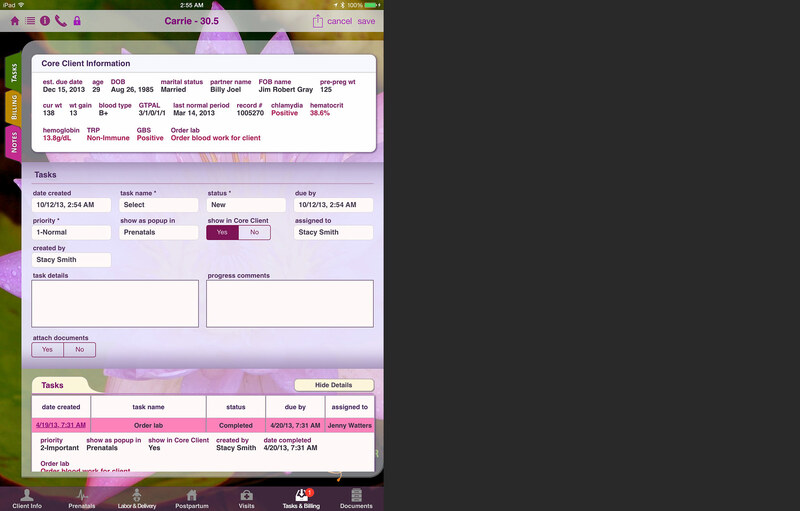 This screenshot shows how professional your exported client record will look. It includes a page header and footer and well formated body content that Mobile Midwife arranges specially just for printing. The header includes your practice name, patient name, EDD or delivery date, client record number (although not shown in this screenshot), and page number. 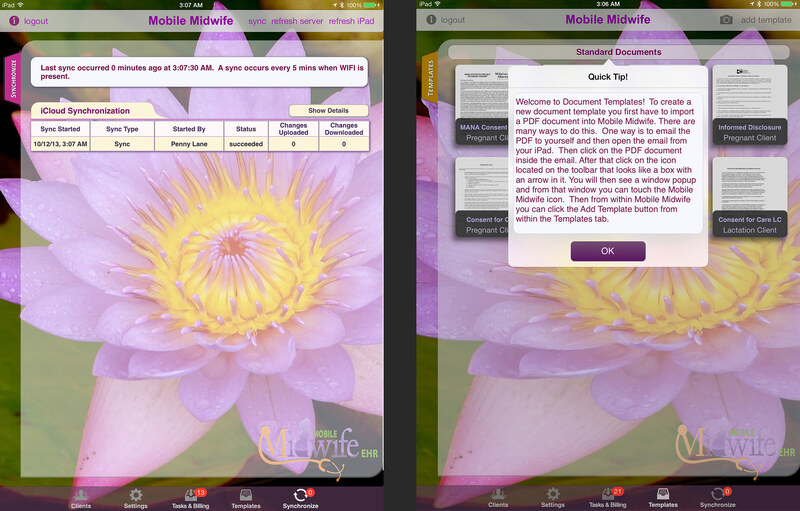 Any PDF or image can be imported into Mobile Midwife under the Templates tab or under a client's Document tab. In the case of Templates, this means you can create your own consent forms and drop text boxes, check boxes and signature boxes on them so that your clients can sign them. Importing a document into the Documents tab is very useful for importing labs, ultrasounds, charts from another care provider and so on. Pictures can also be imported from the camera roll or be taken directly from the Mobile Midwife app. On nearly every from in Mobile Midwife is an "attach documents" field. Pressing Yes on this field will cause an "Add document" button to be displayed. Pressing that button will cause a popup to appear with options to "Take Photo" or "Select Document or Photo" which then allows you to select a document or photo that is already attached in the client's Document folder. Want to be sure you don't forget to draw labs at your next appointment, or to speak with your client about an important issue at the next visit? The new Tasks feature can give you peace of mind by helping you never forget important tasks. 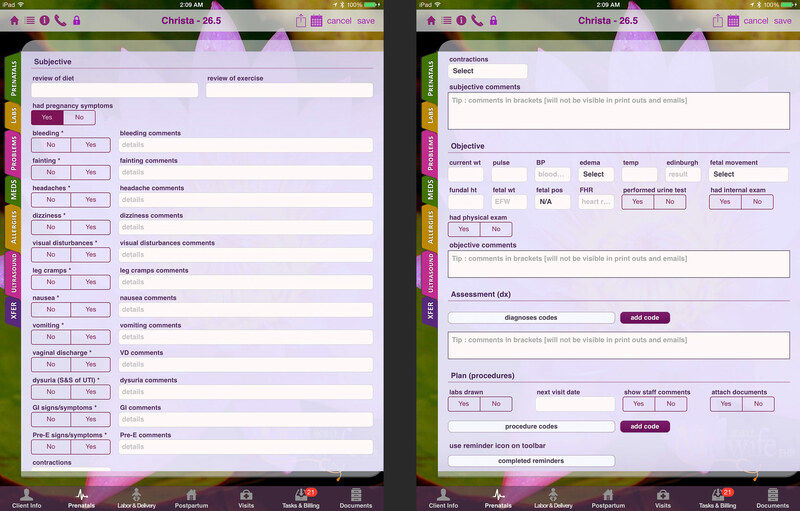 With the tasks features you can create a task and assign it to yourself or a staff member. You can choose to have it displayed in the Core Client Information box and also have it popup whenever you open the client record or even a specific tab such as the prenatal tab. The task will follow a workflow such as New, In Progress, Waiting for Sign Off and Completed. That task can have a due date or be open ended. All outstanding tasks can be view at the client level or practice level for ALL clients. The billing tab tracks charges and payments or adjustments to charges specifically. The practice-level Billing tab shows all clients with a balance. Past due payments are highlighted in red. Create and submit insurance claims to insurance companies either electronically or by paper. 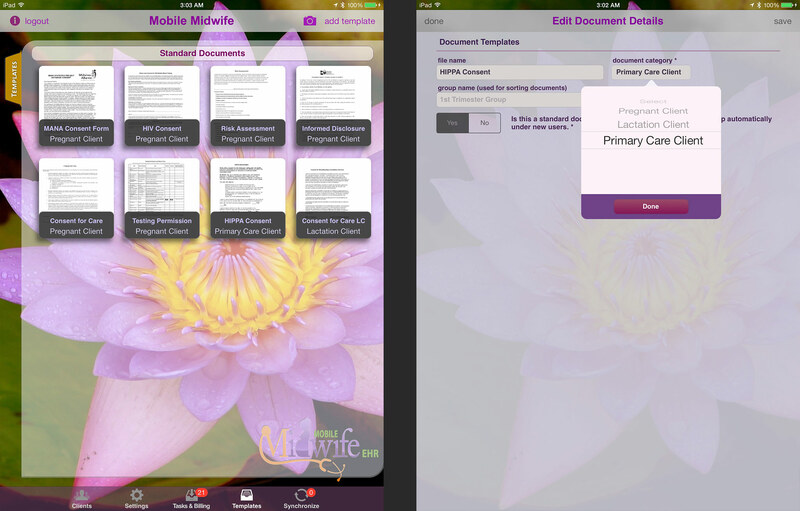 Mobile Midwife will generate both professional and institutional claims and print or electronically submit them. Easily copy billing codes from a visit record and print and mail the claim for reimbursement. Mobile Midwife prints onto they industry standard CMS-1500 or UB-04 paper that can be ordered from anywhere. Place it in the mail and wait for the checks to come back from the insurance company. 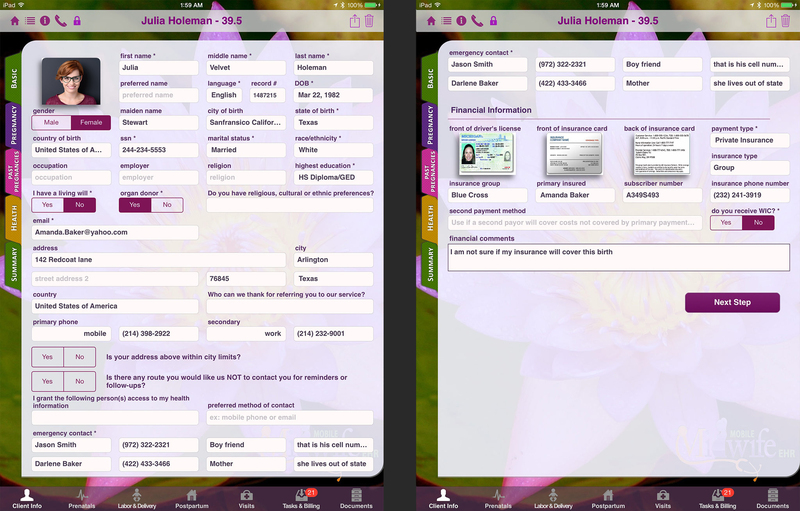 Record payments, appeals and denials in Mobile Midwife and keep track of insurance balances. 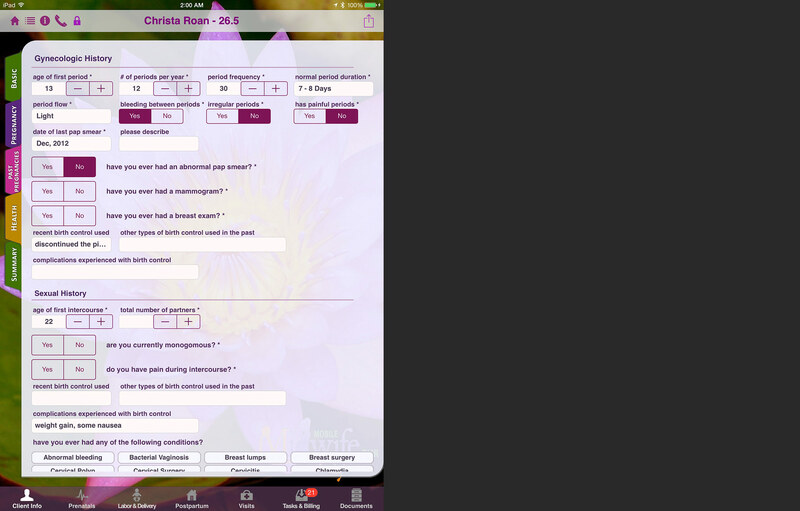 The medications tab is used to keep track of a client's medications. After a client enters their medications and allergies in the Client Info->Health tab, they automatically get copied to this screen. Medications can be managed in great detail here as each record has a detailed comments section, discontinued on, prescribed on, prescribed by, dosage details field and more. 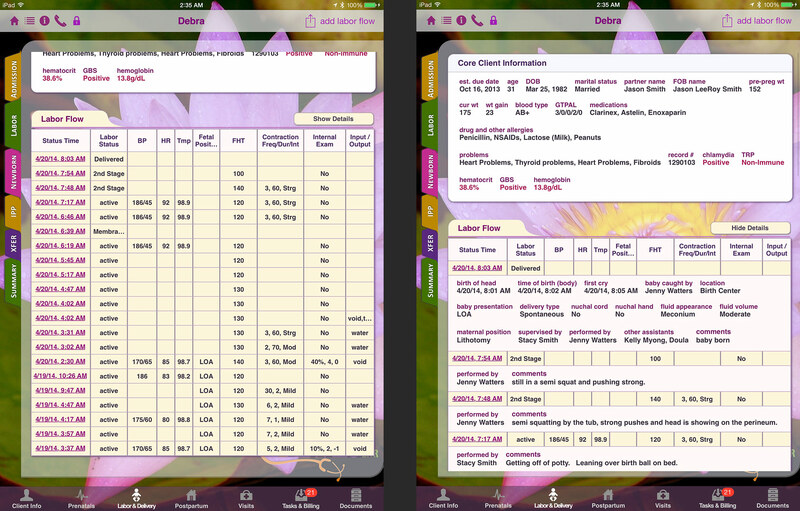 A clients active medications and allergies are also listed in the "Core Client Information" box. With so many areas on the client intake forms that a client can indicate a problem, it would be hard to constantly refer back to all those forms to find out what gyn, health or pregnancy problems your client reported having. 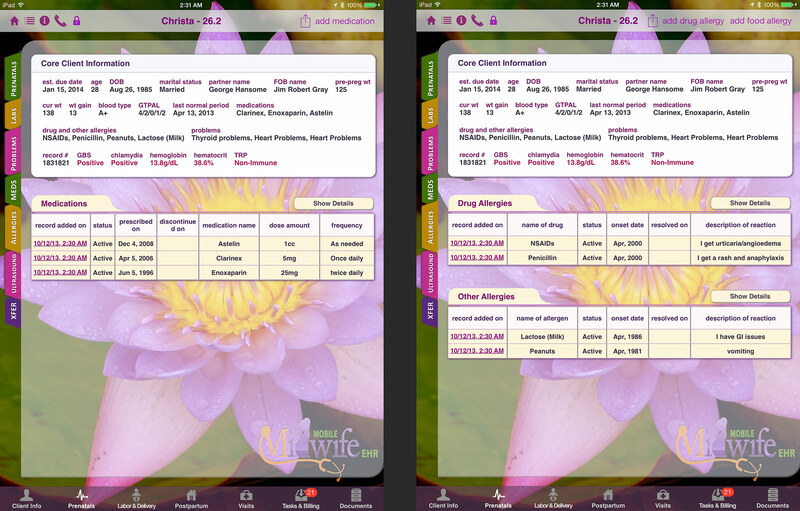 The Problems tab is a centralized location where all client problems/issues are managed by the Midwife. After the client fills out their initial intake forms under the "Client Info" tab, all of their problems from the various sections are copied to this Problems tab. Thereafter any new problems that arise or any existing problems that change or become resolved will be updated here by the Midwife. Also, if the client comes back in the office even an year later and adds some new problems under the Client Info section, then those new problems will also get copied here. Just like with Medications, Problems are also listed in the "Core Client Information" box. 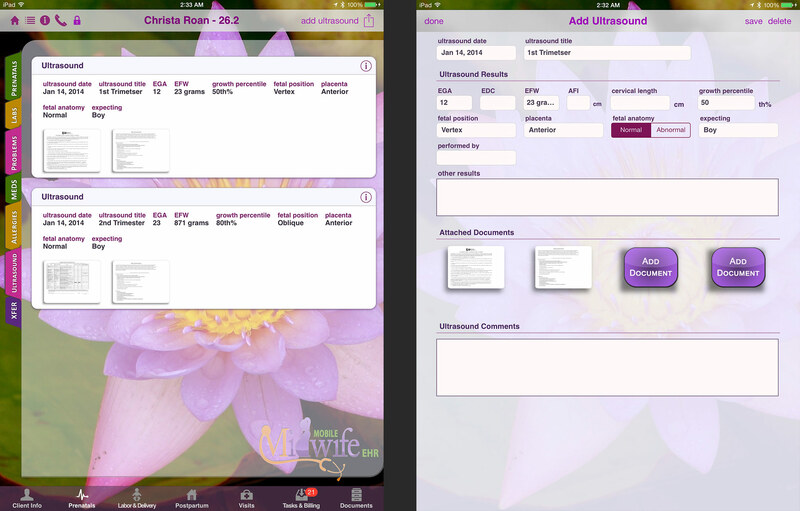 The Ultrasounds tab operates much in the same way as the Labs tab. Fields are provided for the most important fields and the Ultrasound can be attached to the record so you can reference all the results by simply tapping on the thumbnail(s). All Mobile Midwife plans come with at least 3 user accounts. This is because we encourage Midwives to use separate accounts for their students and assistants. Doing so makes it easier to track who charted which records. Users can be added, edited or inactivated using this tab. Passwords can be changed and privileges can be modified also. Account settings are modified here. The default calendar can be set, and many other options can be modified to change how the forms look and what fields appear. 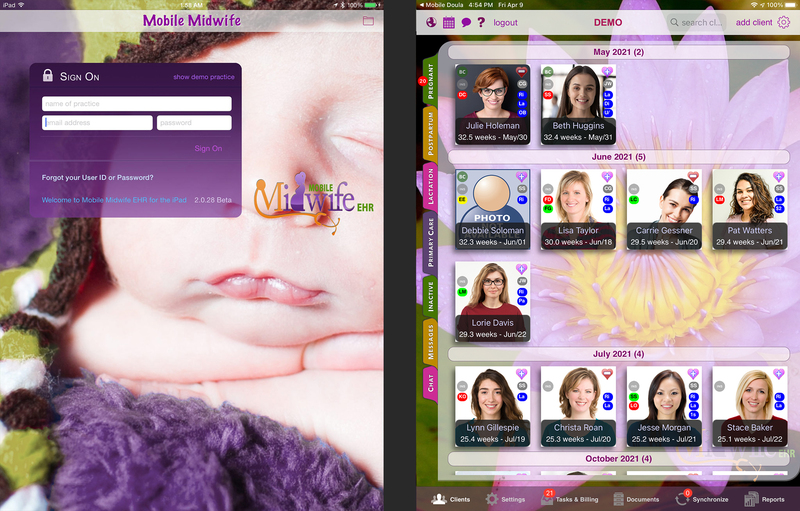 Mobile Midwife can even be configured to support Male clients, if you practice also happens to offer primary care services. 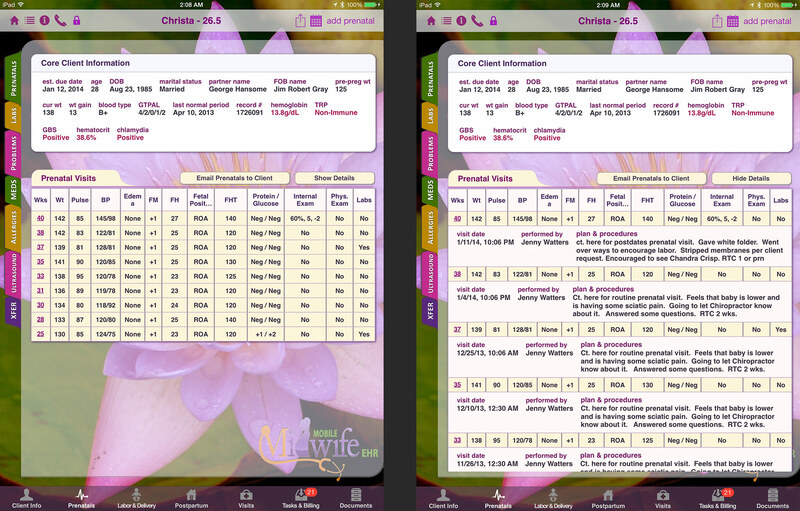 Mobile Midwife automatically synchronizes your data with the Mobile Midwife cloud and other iPads in your practice every five minutes when a Wi-Fi connection is available. This feature also serves as a data backup service. If your iPad is lost, stolen or falls in a birth tub without a waterproof case then you can easily login from any other iPad. 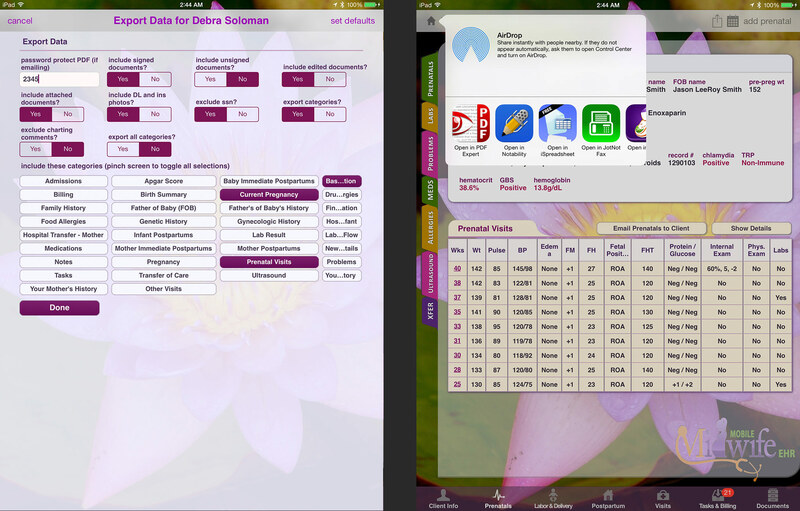 You can even borrow your client's iPad if they have one, download the free Mobile Midwife app from the appstore and login to your practice. 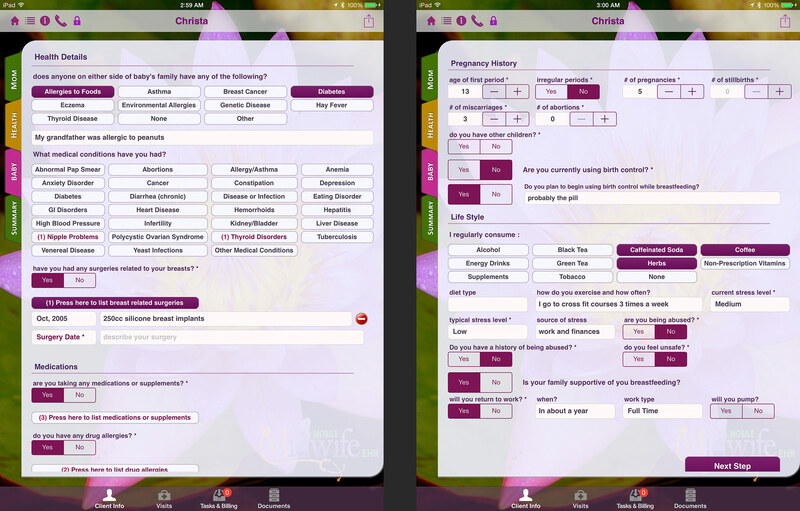 Choosing "Add Lactation Client" will present you with a whole different set of forms and features made just for clients you provide lactation consultation services to. 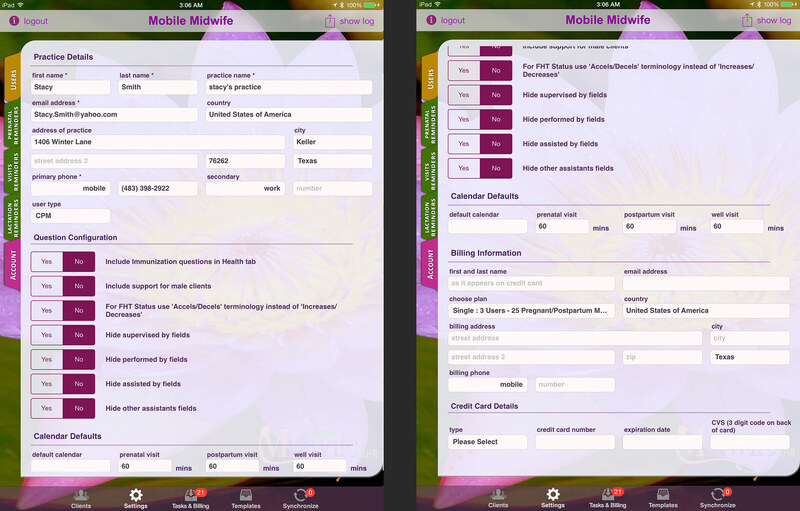 If a client is already in Mobile Midwife as a Postpartum client then it would be more advantageous to use our "Add Lactation Visit" feature under the Visits tab rather than create a completely new record for the client. 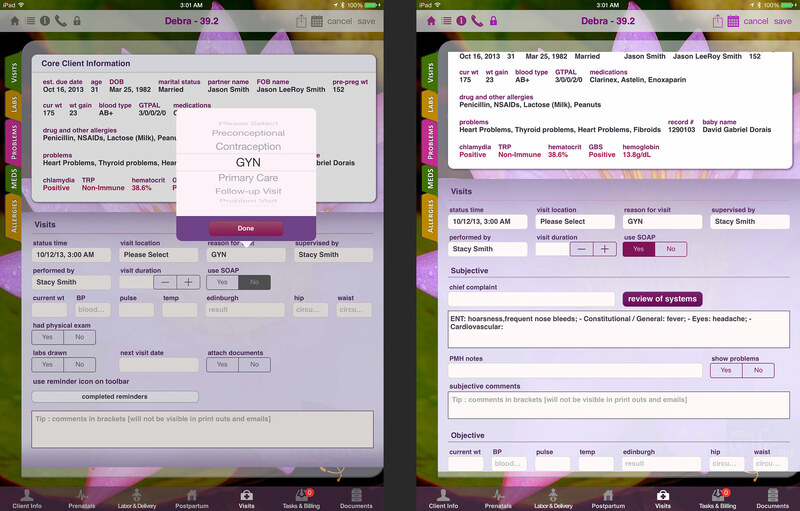 The Visits tab supports Gynecological, Primary Care, Preconceptional and any other visit. 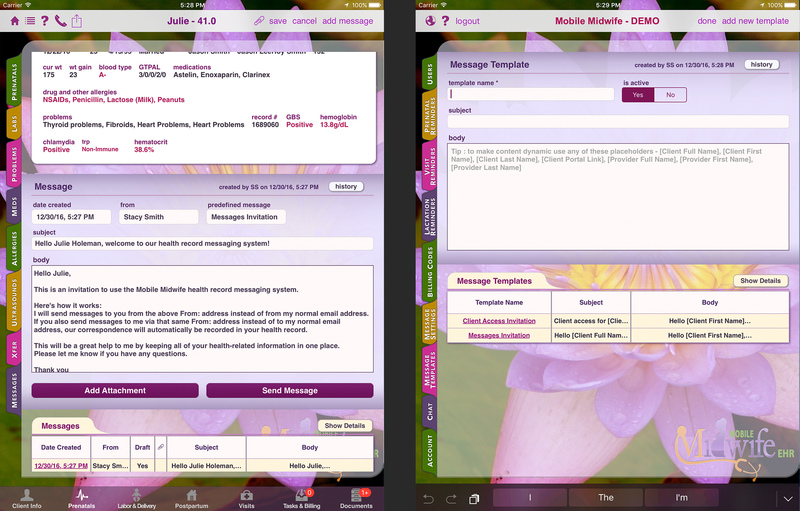 Mobile Midwife can even be configured to support Male clients by setting "Include support for male clients" in the Settings->Account tab. 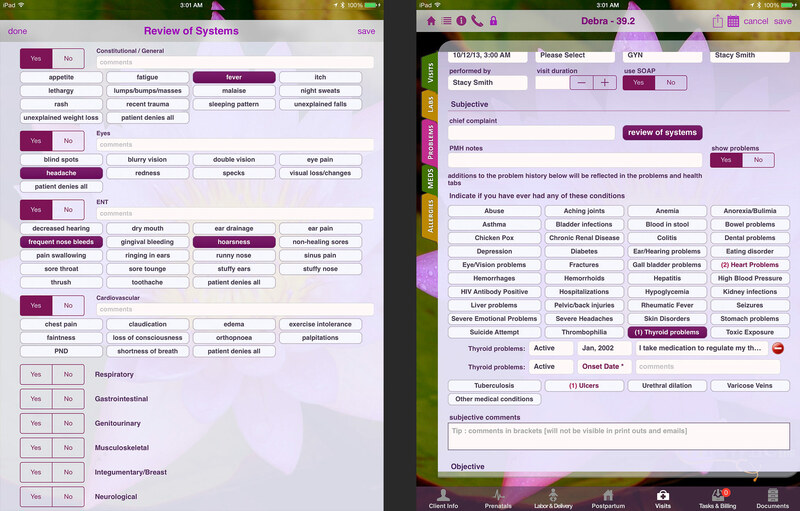 The Visit form support SOAP charting and has a robust ROS (Review of Systems) and exams feature. The Subjective section also provides support for PMH (medical history) and the clients chief complaint. Full support for ICD10 and CPT coding and a reminder system separate from the Prenatal or Lactation reminders is also available. The consent form document templates for Primary care clients are also separate from the Prenatal and Lactation clients. All emails and messages between you and your client are now all recorded under their record in a secure HIPAA compliant manner. Our new Chat feature replaces texting. Instant messages from clients will not wake you up in the middle of the night anymore if they are not in the third trimester. 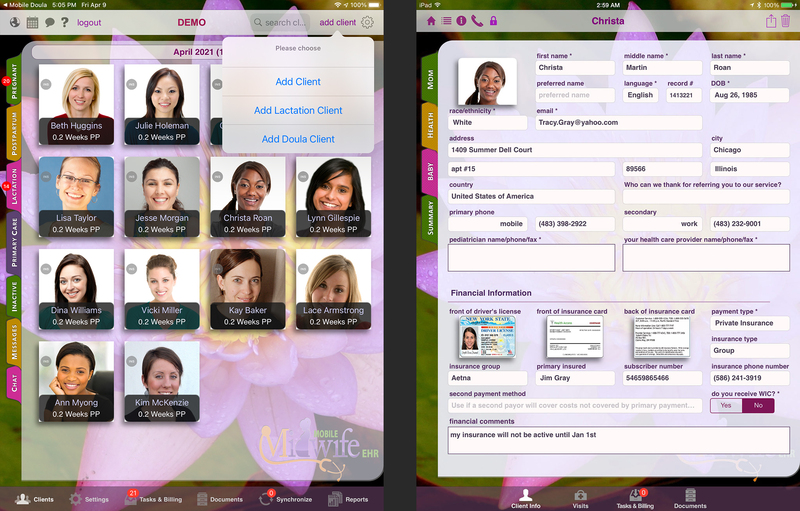 On Thanksgiving Day 2013 we released the new Mobile Midwife EHR web-based client portal, accessible from any PC or Mac. Every practice has its own unique URL that new clients can go to and fill out their paper work prior to the first in-person visit. Once the client completes their paperwork from the comfort of their own home, their record will automatically appear on your iPad(s) and you will receive an email notification.